Gracilaria verrucosa (Hudson) Papenfuss, nom. rejic. Gracilaria verrucosa (Hudson) Papenfuss 1950: 195, nom. rejic. Type locality: Habitat in littoribus marinis passim ["Dwells on the shores of the sea in all directions" England] (Hudson 1762: 470). Notes: Lectotype: Hudson’s description, in the absence of material was initially proposed by Dixon & Irvine (1977: 210) and then supplanted by a specimens in Dillenius's herbarium No. 50 (OXF). According to Silva et al. (1996: 179), the name Sphaerococcus confervoides has been misapplied to this species by G. Martens (1868: 94-95; 1871b: 468) and Theobald (1883: 29). South & Skelton (2003) cite this as an accepted species. See: Yang & Chiang 1982. Taxonomical study on the Gracilaria from Taiwan. J. Fish. Soc. Taiwan 9: 55-71 (in Chinese); Abbott et al. (1985: 67). Xia & Yamamoto (1985: 69) place G. verrucosa in quotes since it was shown, at the Guam workshop (1984), that while the Japanese and Chinese specimens under this name are similar, they are not identical with the British species. Young Meng Chiang (1985: 81) notes that Taiwan specimens identified as "G. verrucosa" differed from both the British specimens and from the Chinese and Japanese material. Lee, Kim & Boo (1995: 213) note that Korean plants of this species differed from British specimens and from Chinese and Japanese plants. Terada & Yamamoto (2002:216, 222) cites Gracilaria verrucosa of Japanese authors as a synonym of G. vermiculophylla. They also note that G. verrucosa has been reported from various regions of the northwestern Pacific but several of the reported specimens were transferred to other species or were described as new species. Abbott (1995: 188) notes that previous Chinese specimens have been relegated to G. asiatica Zhang & Xia or G. tenuistipitata var. liu Zhang & Xia, the latter from Taiwan as well, some of Japanese specimens have been placed in G. vermiculophylla Ohmi and plants from American Pacific coast are now named G. pacifica Abbott. Fiji record needs to be verified (South & Skelton, 2003). "G. verrucosa" has been reported from China & Japan by Bangmei & Yamamoto (1985), Taiwan by Young Meng Chiang (1995), Korea by Lee, Kim & Boo (1995) but these are all different from the British specimens of this species. Norris (1985:113) records G. "verrucosa" for British West Indies. Norris (1985: 133) records G. verrucosa sensu Dawson 1961a for the Gulf of California. Philippines record of Gracilaria "verrucosa" based on illustrations of specimens brought to Guam workshop by Doty (Abbott, 1985).
? : Gulaman, Guraman, Gulaman dagat, Caocaoyan (Madlener 1977). Chinese: Hai mien san, Fen tsai, Hunsai, Hai tsai, Hoi tsoi (Madlener 1977). English: Thin dragon beard plant, Ceylon moss (Madlener 1977). Japanese: Ogo, Ogo nori (Madlener 1977), Ogo-nori (Chapman & Chapman 1980). Vietnamese: Nuoc-mam, Rau-cau, Xoa xoa (Madlener 1977). Type locality: England (Dawson 1961: 215). Type: (Dawson 1961: 215). Notes: Probably not extant among the residue of Hudson collections in the British Museum. Irvine, L. & Steentoft, M. (1995). Proposal to reject the name Fucus verrucosa Huds. (Rhodophyta). Taxon 44: 223-224. Gargiulo, G.M., De Masi, F. & Tripodi, G. (1992). Morphology, reproduction and taxonomy of the Mediterranean species of Gracilaria (Gracilariales, Rhodophyta). Phycologia 31: 53-80. Lee, I.K., Kim, M.-S. & Boo, S.M. (1995). A taxonomic appraisal of Korean Gracilaria verrucosa (Rhodophyta, Gracilariales). In: Taxonomy of Economic Seaweeds. (Abbott, I.A. Eds) Vol.5, pp. 213-222. La Jolla, California: California Sea Grant College System. Norris, J.N. (1985). Gracilaria and Polycavernosa from the Caribbean and Florida: key and list of the species of economic potential. In: Taxonomy of Economic Seaweeds. (Abbott, I.A. & Norris, J.N. Eds) Vol.T-CSGCP-011, pp. 101-113. La Jolla, California: California Sea Grant College Program. Terada, R. & Yamamoto, H. (2002). Review of Gracilaria vermiculophylla and other species in Japan and Asia. In: Taxonomy of Economic Seaweeds with reference to some Pacific species. Vol. VIII. (Abbott, I.A. & Mcdermid, K.J. Eds) Vol.8, pp. 215-224. La Jolla: California Sea Grant College. Xia, B.M. & Yamamoto, H. (1985). Gracilaria species from both China and Japan: key, list and distribution of common and economically important species. In: Taxonomy of economic seaweeds with reference to some Pacific and Caribbean species. (Abbott, I.A. & Norris, J.N. Eds) Vol.I, pp. 69-70. California Sea Grant College Program. Yamamoto, H. (1985). Gracilaria from Japan: Vegetative and reproductive keys and list of the species. In: Taxonomy of economic seaweeds with reference to some Pacific and Caribbean species. (Abbott, I.A. & Norris, J.N. Eds) Vol.I, pp. 77-80. California Sea Grant College Program. Accesses: This record has been accessed by users 19696 times since it was created. Araki, S., Sakurai, T., Oohusa, T. & Kayama, M. (1986). Component fatty acid from Gracilaria verrucosa. Bulletin of the Japanese Society of Scientific Fisheries 52: 1871. Bellanger, F., Verdus, M. C., Henocq, V. & Christiaen, D. (1990). Determination of the composition of the fibrillar part of Gracilaria verrucosa (Gracilariales, Rhodophyta) cell wall in order to prepare protoplasts. Proceedings of the International Seaweed Symposium 13: 527-531. Bellanger, F., Verdus, M.C., Henocq, V. & Christiaen, D. (1990). Determination of the composition of the fibrillar part of Gracilaria verrucosa Gracilariales, Rhodophyta) cell wall in order to prepare protoplasts. Hydrobiologia 204/205: 527-531. Bird, C. J. & Rice, E. L. (1990). Recent approaches to the taxonomy of the Gracilariaceae (Gracilariales, Rhodophyta) and the Gracilaria verrucosa problem. Proceedings of the International Seaweed Symposium 13: 111-118. Bird, C.J. & Rice, E.L. (1990). Recent approaches to the taxonomy of the Gracilariaceae (Gracilariales, Rhodophyta) and the Gracilaria verrucosa problem. Hydrobiologia 204/205: 111-118. Bird, K. T. & Ryther, J. H. (1990). Cultivation of Gracilaria verrucosa (Gracilariales, Rhodophyta) strain G-16 for agar. Proceedings of the International Seaweed Symposium 13: 347-351. Bird, K.T. & Ryther, J.H. (1990). Cultivation of Gracilaria verrucosa (Gracilariales, Rhodophyta) strain G-16 for agar. Hydrobiologia 204/205: 347-351. Bird, K.T. (1984). Seasonal variation in protein : carbohydrate ratios in a subtropical estuarine alga, Gracilaria verrucosa, and the determination of nitrogen limitation status using these ratios. Botanica Marina 27: 111-115. Bird, K.T. (1990). Evidence of 4-O-methyl-alpha-L-galactose in the agar of Gracilaria verrucosa Strain G-16. Journal of Applied Phycology 2: 383-384. Bird, K.T., Dawes, C.J. & Romeo, J.T. (1980). Patterns of non-photosynthetic carbon fixation in dark held, respiring thalli of Gracilaria verrucosa. Zeitschrift für Pflanzenphysiologie 98: 359-364. Boraso de Zaixso, A. L. (1987). Gracilaria verrucosa in Golfo Nuevo, Chubut, Argentina. Biological parameters and envioronmental factors. Proceedings of the International Seaweed Symposium 12: 239-244. Boraso de Zaixso, A.L. & Paternoster, I. (1985). Demografía, reproducción y propagación enpoblaciones de Gracilaria verrucosa (Hudson) Papenfuss de la provincia de Chubut (Rep. Argentina). I. Golfo Nuevo. Contribución CENPAT 99: 26. Boraso de Zaixso, A.L. (1984). Crecimiento de Gracilaria verrucosa en condición suspendida. Mem. de la Sociedad Latinoamericana de Acuicultura 5(3): 415-418. Boraso de Zaixso, A.L. (1987). Gracilaria verrucosa in Golfo Nuevo, Chubut, Argentina. I. Populatio parameters and environmental factors. Hydrobiologia 151/152: 238-244. Boraso de Zaixso, A.L. (1989). Ecological considerations for the possibility of culturing Gracilaria verrucosa in Argentina. In: Cultivation of seaweeds in Latin America. (De Oliveira, E.C. & Kautsky, N. Eds), pp. 51-58. Boraso de Zaixso, A.L. (1995). Utilización de Gracilaria verrucosa (Hudson) Papenfuss en Bahía Arredondo (Prov. de Chubut, Argentina). Naturalia Patagónica Series Cs. Biol. 3(1-2): 85-106. Cancino, J. M., Muñoz, M. & Orellana, M. C. (1987). Effects of epifauna on algal growth and quality of the agar produced by Gracilaria verrucosa (Hudson) Papenfuss. Proceedings of the International Seaweed Symposium 12: 223-237. Candia, A. & Infante, R. (1988). Cultivation of Gracilaria verrucosa (Hudson) Papenfuss and Iridaea ciliata Kutzing (Rhodophyta, Gigartinaceae),"in vitro" : induced shedding and carpospore colonisation on different substrates.. Guyana. Bot 45((1-4)): 297-304. Chao-yuan, W., Yan-xia, Z., Ren-zhi, L., Zuo-sheng, P., Ying-fang, Z., Qing-chen, L., Jing-pu, Z. & Xiao, F. (1984). Utilization of ammonium-nitrogen by Porphyra yezoensis and Gracilaria verrucosa. Proceedings of the International Seaweed Symposium 11: 475-477. Chiles, T.C., Bird, K.T. & Koehn, F.E. (1989). Influence of nitrogen availability on agar-polysaccharides from Gracilaria verrucosa strain G-16: structural analysis by NMR spectroscopy. Journal of Applied Phycology 1: 53-58. Choi, H.G., Kim, Y.S., Kim, J.H., Lee, S.J., Park, E.J., Ryu, J. & Nam, K.W. (2007). Effects of temperature and salinity on the growth of Gracilaria verrucosa and G. chorda, with the potential for mariculture in Korea. Proceedings of the International Seaweed Symposium 18: 43-51. Christiaen, D. & Bodard, M. (1983). Spectroscopie infrarouge de films d'agar de Gracilaria verrucosa (Huds.) Papenfuss. Botanica Marina 26: 425-427. Cinelli, F., Lenzini, S. & Papi, I. (1989). Condizioni sperimentali ottimali per l'accrescimento di Gracilaria verrucosa e di altre agarofite marine. In: Alghe e loro Utilizzatione Convegno Nazionale. ( Eds), pp. 97-123. Lecce: Camera di Commercio Industria Artigiantoe Agricoltura; Università Degli Studi. Dawes, C.J. & Koch, E.W. (1990). Physiological responses of the red algae Gracilaria verrucosa and G. tikvahiae before and after nutrient enrichment. B MARIN SCI 46(2): 335-344. Dawes, C.J., Chen, C.-P., Jewett-Smith, J., Marsh, A. & Watts, S.A. (1984). Effect of phosphate and ammonium levels on photosynthetic and respiratory responses of the red alga Gracilaria verrucosa. Marine Biology, Berlin 78: 325-328. Delivopoulos, S.G. & Tsekos, I. (1983). A light microscope study of carposporophyte development in Gracilaria verrucosa (Hudson) Papenfuss. Annals of Botany 52: 317-323. Destombe, C., Godin, J. & Remy, J.-M. (1990). Viability and dissemination of spermatia of Gracilaria verrucosa (Gracilariales, Rhodophyta). Proceedings of the International Seaweed Symposium 13: 219-223. Destombe, C., Godin, J., Lefevre, J.R., Dehorter, O. & Vernet, P. (1992). Differences in dispersal abilities of haploid and diploid spores of Gracilaria verrucosa (Gracilariales, Rhodophyta). Botanica Marina 35: 93-98, 6 figs. Destombe, C., Valero, M., Vernet, P. & Couvet, D. (1989). What controls haploid-diploid ratio in the red alga, Gracilaria verrucosa?. J. Evol. Biol. 2: 317-338. Drago, D., Genchi, G. & Sortino, M. (1980). Insediamenti di Gracilaria verrucosa (Hudson) Papenfuss in ambienti del trapanese. Atti del Congresso SIBM. Mem. Biol. Marine e Oceanogr. 10(Suppl. ): 163-167. Durairatnam, M. & Queiróz Santos, N. d. (1981). Agar from Gracilaria verrucosa (Hudson) Papenfuss and Gracilaria sjoestedtii Kylin from Northeast Brasil. Proceedings of the International Seaweed Symposium 10: 669-674. Durairatnam, M. (1965). The ecology of Gracilaria verrucosa (Hudson) Papenfuss (formerly G. confervoides (L.) Greville) in Koddiyar Bay, Trincomalee. Fisheries Research Station, Ceylon Bulletin 18: 29-34, 1 fig, 2 tables. Feoli, E., Giaccone, G. & Lokar-Coassini, L. (1979). Determinazione delle tecniche e dei metodi di coltivazione dell'alga Gracilaria verrucosa. In: Le lagune di Grado e di Marano. Richerche idrobiologiche ed esperimenti di acquicoltura. (Giulia, R.A.F.-V. Eds), pp. 11-20. Udine: Industrie Grafiche Del Bianco. Fredericq, S. & Hommersand, M.H. (1989). Proposal of the Gracilariales ord. 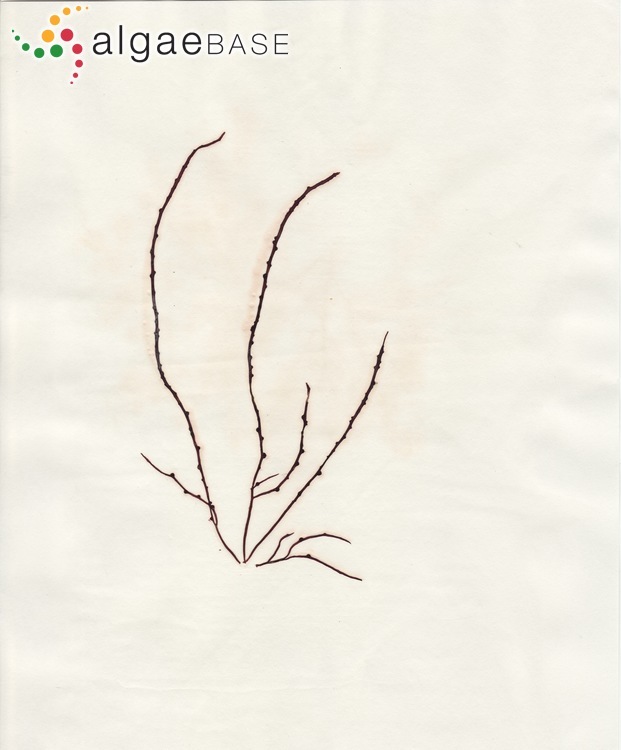 nov. (Rhodophyta) based on an analysis of the reproductive development of Gracilaria verrucosa. Journal of Phycology 25: 213-227, 57 figs..
Friedlander, M., Lipkin, Y. & Yaphe, W. (1981). Composition of agars from Gracilaria cf. verrucosa and Pterocladia capillacea. Botanica Marina 24: 595-598. Giaccone, G., Princi, M., Feoli, E., Coassini, L., Zi Longo, R. & Tortul, V. (1979). Valutazione delle risorse vegetali lagunari del Basso Tirreno e sperimentazione di coltivazione controllata dell'alga rossa Gracilaria verrucosa e di altre agarfite in Sicilia. Convengo Scientifico Nazionale P F Oceanografia e Fondi Marini 5-7: 423-435. Godin, J., Destombe, C. & Maggs, C.A. (1993). Unusual chromosome number of Gracilaria verrucosa (Gracilariales, Rhodophyta) in the Cape Gris-Nez area, Northern France. Phycologia 32: 291-294, 2 figs, 3 tables. Imbs, A.B., Vologodskaya, A.V., Nevshupova, N.V., Khotimchenko, S.V. & Titlyanov, E.A. (2001). Response of prostaglandin content in the red alga Gracilaria verrucosa to season and solar irradiance . Phytochemistry 58: 1067-1072. Izumi, K. (1972). Chemical heterogeneity of the agar from Gracilaria verrucosa. J Biochem 72: 135-140. Jones, W.E. (1959). Experiments on some effects of certain environmental factors on Gracilaria verrucosa (Hudson) Papenfuss. Journal of the Marine Biological Association of the United Kingdom 38: 153-167. Jones, W.E. (1959). The growth and fruiting of Gracilaria verrucosa (Hudson) Papenfuss. Journal of the Marine Biological Association of the United Kingdom 38: 47-56. Kakita, H., Fukuoka, S., Obika, H. & Kamishima, H. (1999). Isolation and characterisation of a fourth hemagglutinin from the red alga Gracilaria verrucosa from Japan. Proceedings of the International Seaweed Symposium 16: 563-570. Kakita, H., Fukuoka, S., Obika, H., Li, Z.F. & Kamishima, H. (1997). Purification and properties of a high molecular weight hemagglutinin from the red alga, Gracilaria verrucosa. Botanica Marina 40: 241-247. Khotimchenko, S.V. & Levchenko, E.V. (1997). Lipids of the Red Alga Gracilaria verrucosa (Huds.) Papenf.. Botanica Marina 40: 541-545. Khotimchenko, S.V. (2006). Variations in lipid composition among different developmental stages of Gracilaria verrucosa (Rhodophyta). Botanica Marina 49: 34-38. Kim, M.S., Lee, I.K. & Boo, S.M. (1993). Phenology and morphology on Gracilaria verrucosa (Rhodophyta) on the west coast of Korea : A statistical approach. Japanese Journal of Phycology 41: 345-350. Kling, R. & Bodard, M. (1987). Morphogenesis of the frond of Gracilaria verrucosa, (Huds.) Papenfuss: the differentiation of vegetative and sexual areas. Proceedings of the International Seaweed Symposium 12: 205-206. Koch, E.W. & Lawrence, J. (1987). Photosynthetic and respiratory responses to salinity changes in the red alga Gracilaria verrucosa. Botanica Marina 30: 327-329. Kosovel, V. & Talarico, L. (1982). Preliminary ultrastructural characterization of R-phycocyanin from the red alga Gracilaria verrucosa (Huds.) Papenfuss. Photosynthetica 16: 373-374. Levy, I., Beer, S. & Friedlander, M. (1990). Growth, photosynthesis and agar in wild-type strains of Gracilaria verrucosa and G. conferta (Gracilariales, Rhodophyta), as a strain selection experiment. Hydrobiologia 204/205: 381-387. Levy, I., Beer, S. & Friedlander, M. (1990). Growth, photosynthesis and agar in wild-type strains of Gracilaria verrucosa and Gracilaria conferta (Gracilariales, Rhodophyta), as a strain selection experiment. Proceedings of the International Seaweed Symposium 13: 381-387. Lignell, Å. & Pedersén, M. (1989). Agar composition as a function of morphology and growth rate. Studies on some morphological strains of Gracilaria secundata and Gracilaria verrucosa (Rhodophyta). Botanica Marina 32: 219-227. Min-Thein, U. & Aung Myint, U. (1982). Pond culture of Gracilaria spp. (G. edulis, G. verrucosa, G. crassa, G. foliifera) at Setse. Technical Reports. pp. 1-7, 7 pp..
Noguchi, T., Matsui, T., Miyazama, K., Asakawa, M., Iijima, N., Shida, Fuse, M., Hosaka, Y., Kirigaya, C., Watabe, K., Usui, S. & Kukagawa, A. (1994). Poisoning byy the red alga 'ogonori' (Gracilaria verrucosa) on the Nojima Coast, Yokohama, Kanagawa Prefecture, Japan.. Toxicon 32: 1533-1538. Ogata, E., Matsui, T. & Nakamura, H. (1972). The complete life cycle of Gracilaria verrucosa in vitro. Proceedings of the International Seaweed Symposium 7: 135. Ondarza, M., Karamanos, Y., Christiaen, D. & Stadler, T. (1987). Variation in the composition of agar polysaccharides from Gracilaria verrucosa, cultivated under controlled conditions. Food Hydrocolloids 1(5/6): 507-509. Oza, R.M. & Krishnamurthy, V. (1968). Carpospore germination and early stages of development in Gracilaria verrucosa (Huds.) Papenf. Phykos 6: 84-86, 19 figs. Oza, R.M. & Krishnamurthy, V. (1968). Studies on carposporic rhythm of Gracilaria verrucosa (Huds.) Papenf. Botanica Marina 11: 118-121, 2 figs. Oza, R.M., Tewari, A. & Rajyaguru, M.R. (1989). Growth and phenology of red alga Gracilaria verrucosa (Huds.) Papenf.. Indian Journal of Marine Sciences 18: 82-86, 5 figs, 1 table. Ren-Zhi, L., Ren-Yi, C. & Zhao-Cai, M. (1984). A preliminary study of raft cultivation of Gracilaria verrucosa and Gracilaria sjoestedtii. Proceedings of the International Seaweed Symposium 11: 252-254. Rice, E.L. & Bird, C.J. (1990). Relationships among geographically distant populations of Gracilaria verrucosa (Gracilariales, Rhodophyta) and related species. Phycologia 29: 501-510. Rmiki, N.E., Lemoine, Y., Kling, R. & Cabioch, J. (1994). Distribution verticale des Gracilaires sur le littoral et relation avec la photoinhibition. Gracilariopsis confervoides, Gracilaria verrucosa, Gracilaria multipartita. Cryptogamie: Algologie 15(1): 11 (abstract). Rodríguez de Rios, N. (1986). Sobre la verdadera identidad de la llamada Gracilaria verrucosa (Hudson) Papenfuss en Venezuela. Ernstia 38: 32-39. Romanello, E., Arnoldi, G., García, H., Taylor, R. & Medina, M. (1993). Evaluación del area y biomasa de la pradera de Gracilaria verrucosa (Hudson) Papenfuss en la bahía Melo, provincia del Chubut, Argentina. Naturalia Patagónica 1(2): 111-114. Rotmann, K.W.G. (1990). Saldanha Bay, South Africa: recovery of Gracilaria verrucosa (Gracilariales, Rhodophyta). Proceedings of the International Seaweed Symposium 13: 325-330. Rotmann, K.W.G. (1990). Saldanha Bay, South Africa: recovery of Gracilaria verrucosa (Gracilariales, Rhodophyta). Hydrobiologia 204/205: 325-330. Rueness, J., Mathisen, H.A. & Tananger, T. (1987). Culture and field observations on Gracilaria verrucosa (Huds.) Papenf. (Rhodophyta) from Norway. Botanica Marina 30: 267-276. Sheng Yao, S., Yan Xia, Z., Zhi En, L. & Wan Qing, L. (1984). The yield and properties of agar extracted from different life stages of Gracilaria verrucosa. Proceedings of the International Seaweed Symposium 11: 551-553. Skriptsova, A.V. & Choi, H.-G. (2009). Taxonomic revision of Gracilaria "verrucosa" from the Russian Far East based on morphological and molecular data. Botanica Marina 52(4): 331-340. Stokke, K. (1957). The red alga Gracilaria verrucosa in Norway. Nytt Mag. Botanikk 5: 101-111. Tagawa, S. & Kojima, Y. (1972). The alkali-treatment of the mucilage of Gracilaria verrucosa. Proceedings of the International Seaweed Symposium 7: 447-450. Talarico, L., Guida, G., Murano, E. & Piacquadio, A.M. (1990). Ultrastructure of the cell wall of Gracilaria cf. verrucosa (Gracilariales, Rhodophyta): effects of steam explosion. Hydrobiologia 204/205: 597-601. Talarico, L., Guida, G., Murano, E. & Piacquaido, A. M. (1990). Ultrastructure of the cell wall of Gracilaria cf. verrucosa (Gracilariales, Rhodophyta): effects of steam explosion. Proceedings of the International Seaweed Symposium 13: 597-601. Titlyanova, T.V., Titlyanov, E.A. & Kozmenko, V.B. (1990). Unattached form of Gracilaria verrucosa in lagoons of the southern Primorye. Biologiya morya 4: 45-50. Wang, Y.C., Pan, G.P. & Chen, L.C.-M. (1984). Studies on Agarophytes II. Field observations and growth of Gracilaria cf. verrucosa (Rhodophyta) in Shantou District, Guangdong, P.R.C.. Botanica Marina 27: 265-268. Whyte, J.N.C., Englar, J.R., Saunders, R.G. & Lindsay, J.C. (1981). Seasonal variations in the biomass, quantity and quality of agar, from the reproductive and vegetative stages of Gracilaria (verrucosa type). Botanica Marina 24: 493-501. Yamamoto, H. & Sasaki, J. (1988). Interfertility between so-called Gracilaria verrucosa (Huds.) Papenfuss and G. vermiculophylla (Ohmi) Papenfuss in Japan. Bulletin of the Faculty of Fisheries Hokkaido University 39: 1-3. Yenigül, M. (1993). Seasonal changes in the chemical and gelling characteristics of agar from Gracilaria verrucosa collected in Turkey. Proceedings of the International Seaweed Symposium 14: 627-631. Yeniguel, M. (1993). Seasonal changes in the chemical and jelly characteristics of agar from Gracilaria verrucosa collected in Turkey. Hydrobiologia 260/261: 627-631. Zatnika, A. & Krisnadi, M. (1992). Pengaruh metode penanaman dan frekuensi perendaman bibit dalam larutan urea terhadap laju pertumbuhan harian, kandungan dan kekuatan gel agar-agar Gracilaria verrucosa. pp. 1-16..
Zhou, Y.-H. & Ragan, M. A. (1996). Nuclear-encoded protein-coding genes of the agarophyte Gracilaria verrucosa (Gracilariales, Rhodophyta). Proceeding of the International Seaweed Symposium 15: 429-436.